2mm Solid Shiny Copper Round Beads (100) Bright Finish! 3mm Solid Copper Shiny Round Beads (100) Bright Finish! 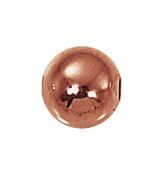 4mm Solid Copper Shiny Round Beads (100) Bright Finish! 5mm Solid Copper Shiny Round Beads (100) Bright Finish! 6mm Solid Copper Shiny Round Beads (100) Bright Finish!